Yep, there’s more. Here’s where the house gets weird. 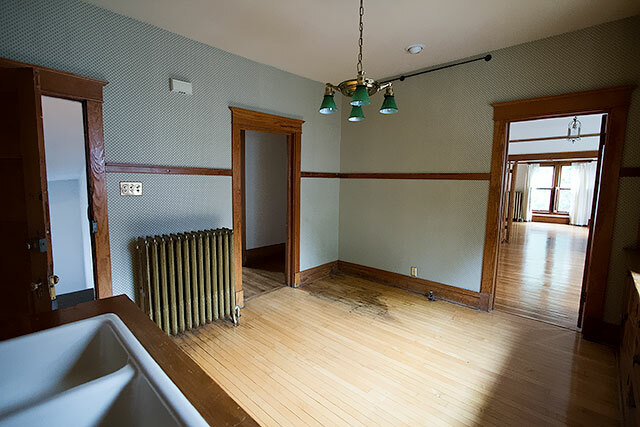 The second floor is a mirror of the first, and would have functioned as the second of three apartments. Our bedroom would have been the living room. And behold! Our second kitchen! There’s a sink, and the same built-in cabinets as on the first floor. No stove or fridge, but there is a capped off gas line. 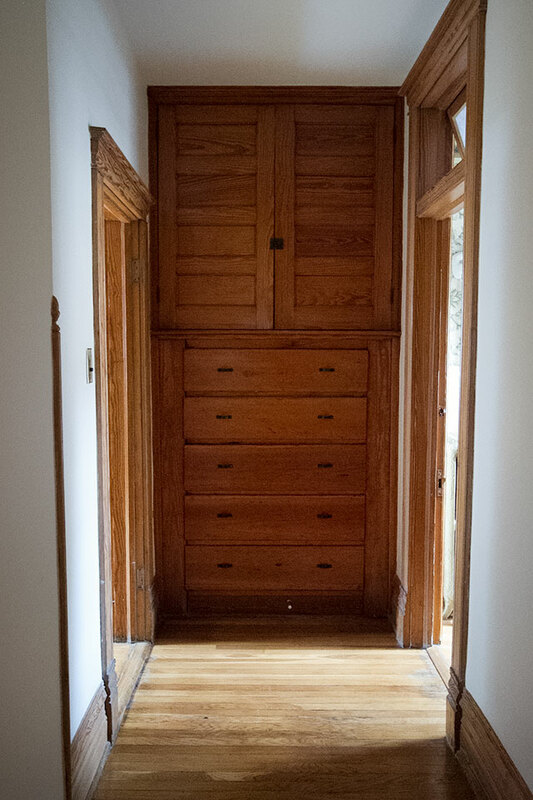 Continuing on, there is built-in storage in the hallway next to the bathroom, just as there is on the first floor. There was a pull-chain toilet in one of the homes my family lived in for a few years when I was a kid. It was a reproduction, whereas this is the real thing. I don’t love it, but the rest of the house makes up for some of its oddities. No shower (as I mentioned), but the tub is cute. We may retrofit this to include a shower, or even just add a hand-shower. There’s also plenty of room (as you can likely guess) to create a master bathroom someday. There is also one more room on the second floor, between our bedroom and the second kitchen. It would have been a bedroom originally, before the house was chopped up. It would be easy enough to convert back into a bedroom (wall up a couple of doorways, add a closet), but we think it might replace our old library. Can’t you just see a rolling library ladder in there? take out the sink and i think that 2nd kitchen would make a great study/craft room for the kids! Keep the sink. A sink in a craft room would be amazing. I was thinking the same thing Jamie. When I first saw it I thought turn it into a craft room with a sink so you don’t have to worry about cleaning up the messes. Totally agree. When I saw sink plus storage I immediately thought “mother of all craft/play rooms”. That’s what I was thinking too! It would a perfect craft/play/study room! That’s what I thought immediately too. Easy clean up for paint brushes/glue and other messy projects. And all that storage! Love! Yes, ultimate craft and homeschool room…this totally makes me want that house. Um, wow. Can I come live in your attic?! You mentioned that big possible-future-library is between your room and the kitchen. That kitchen could be one darn amazing master-bath/laundry/dressing room! And yes to a rolling ladder! Oh my! Did you know that full posts aren’t showing in Feedly, could you change that? Thanks! Yes, I agree with Emily. I’m loving the Victorian house tour, but the posts are being truncated in the reader and it *almost* discourages me from reading the rest of the post! Sorry! Someone asked about the truncated posts yesterday too. They’re handy for long, photo-heavy posts so that the main page doesn’t get bogged down. I’ve used jumps before for that purpose before, but they’re not usually done four-in-a-row. 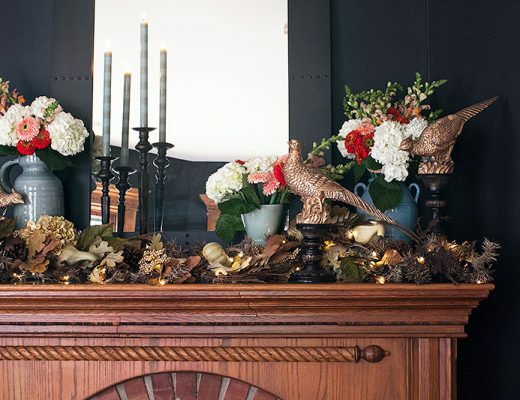 Once we’re beyond these initial house tour posts, you won’t see them used so frequently! This house is MASSIVE! I can’t wait to see how it looks once you move in all the furniture and decorate. It’s great to see the original framework/layout so we can see the changes. LEAVE the sink and make the 2nd kitchen a craft room! Congratulations on the house, it truly is amazingly stunning! I follow you from Stockholm and you are an inspiration, am awaiting with excitement what will become of the interiors. The second kitchen, maybe a massive bathroom…? There could be a nice plus to having your laundry on the floor where you take your clothes off. Dragging it up to the 3rd (or even down 2 floors to the basement) might get old pretty quickly. I have to agree with this. There’s nothing wrong with an uber nice laundry room. I’m also in favour of a craft room, so perhaps that could work in the third floor kitchen? My biggest advice is the tried and true live with it for awhile until you figure out what works for you. You obviously have no shortage of space, so leaving a few rooms empty (or at least undone) for a little while shouldn’t be a problem. Yes, we aren’t in a rush to figure everything out immediately. I’d like to live in the home for a while before making any big structural/functional changes. so cool – and so much space! my house was built in the 40’s but has a lot of the original wood trim that i love too. do you know what the previous owners used that second kitchen for? I’m not sure. I think they may have had renters until recently on the third floor, but not on the second. Can’t wait to see your furniture begin to fill the space! 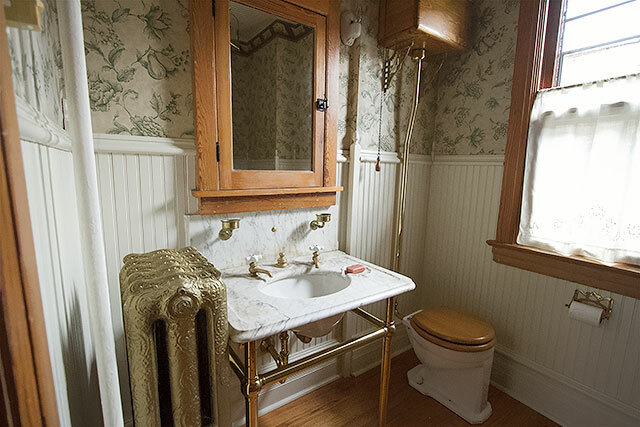 I love everything about the green and gold bathroom too! I’d love to see it if you find it again! Here’s one at This Old House. http://www.thisoldhouse.com/toh/photos/0,,20576261_21130115,00.html The description sounds amazing and efficient. This one seems to be very popular too. Oh man! I would make that second kitchen into an office space. This house is incredible! Looks like everyone has the same idea I did which is to make that second kitchen a studio. It looks like it gets amazing light and having a sink in there would be really handy. I too say leave the sink and have it be an art/craft room, you can still have the laundry there too. When we were looking at two flats to convert, we were pretty excited about having a second kitchen to convert into my husbands painting studio. That didn’t happen for us, oh well. I vote the old kitchen becomes an amazing closet room!!! Is there a space already designated for a playroom? If not, the second kitchen could be great for that. Even has a sink for washing up after messes! We might do a playroom in the attic, because the kids love the nook off of the room we’d use. 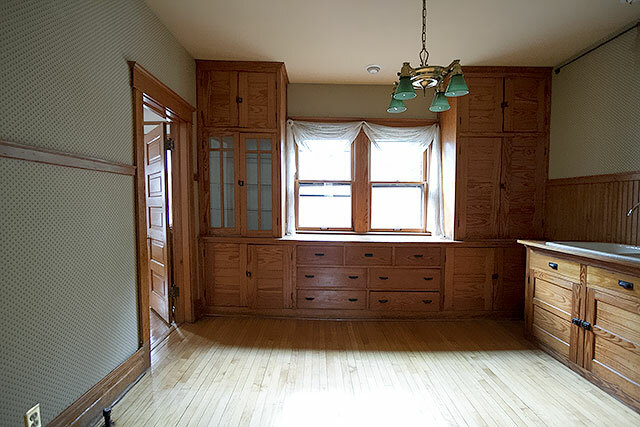 We also had a second kitchen in our 1800’s Philadelphia row house when we moved it. The home was owned by an old Italian family, and they told us it was pretty common for homes to have a second kitchen that fwas part of the in-law suite. We completely gutted the house, so our former second kitchen is now a guestroom/playroom. Definitely a craft room! A sink would be so handy for kids when you all start crafting together! I am in love with the little green chandelier. I love all the weird things in a space. I’m excited to see what you do with the space! You have so much space after all. I vote playroom or craft room with a sink, too! Those drawers and cabinets would be perfect for art supplies. This is seriously the best house ever! Jealous!! That second kitchen would make an amazing art/painting studio!!! Seeing as you aren’t necessarily a painter, it could still just as easily be an awesome crafting studio!! I agree with most people, it’d be an awesome craft room with a tall work table and stools in the middle of the room. I wish I could see a floor plan…I totally get the whole security thing. But, would be easier to understand how it is all laid out to determine the best use of the spaces…I am an architectural designer, go figure, haha. But…with you not having a master bathroom, I would totally take advantage of having the plumbing in that second kitchen. You could have one sweet master bath/walk-in closet!! And the room in-between your room and “master bath” can be a nice library sitting area for you to relax before heading to bed. Your house is absolutely gorgeous, CONGRATS!! I look forward to following your progression into making this house your home, sweet, home. With this many floors, I would start theming them like the rooms from Shrute Farms. 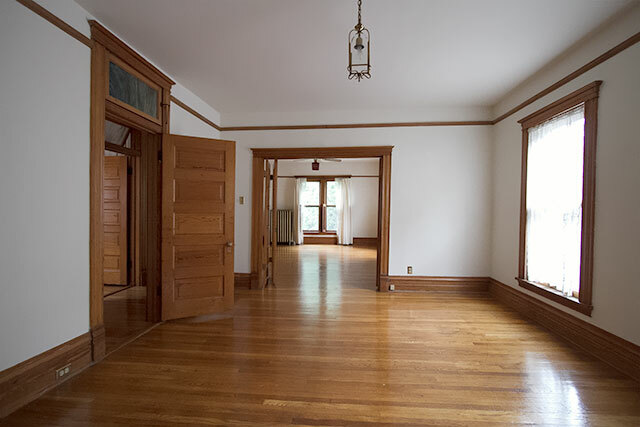 Seriously amazing space – a blank slate with lots of character. oxymoron? 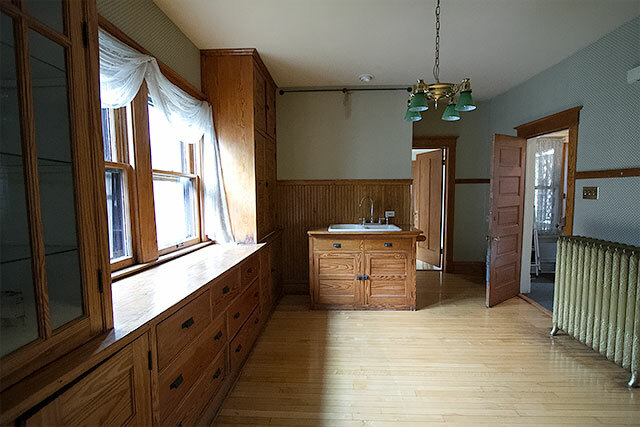 As everyone else mentioned, the room with the sink would make a great art space/studio. It’s great for kids for their art projects too…and cleanup is a breeze with a sink right there. It’s just a beautiful space to share for creating. Another thought would be to add a little kitchenette type thing and have a media room there…movie night! Pizza night! That sort of thing. Oh, keep the sink and use the room as as craft room. I would LOVE to have a sink in my craft room! Can you PLEASE just let us all visit!? I’m dying to see this house in person! Laundry + Crafting can go hand in hand. Sometimes there’s downtime, letting glue dry, waiting for something to print or cut.. perfect time to fold some laundry. lol Hide the washer and dryer in a custom cabinet or under a skirted table and you’re set to go! My first thought is craft room/playroom too for that second kitchen… but I’ve always dreamed of a “family closet” style laundry room where you have in a single room the washer and dryer and all the clothes that are in rotation for the all or most of the family for the current season. This room has the ideal storage for that, and it seems like it could be big enough to also have a little private dressing area. How nice would that be to do the laundy, store it all and have your kids get dressed– all in the same space… no lugging laundry up and down, sorting it all, bringing it to seperate rooms over and over again for 18 years. And you could still have your private pretty closet in your own room. Love the idea of a library, I think it would be amazing. Jealous! This is why I love old houses! I love the craft room idea for the second kitchen, easy clean up and could be so useful for many purposes. Kids could have a place for science projects and other experiments. A chemistry set! Gorgeous! I absolutely LOVE old houses. 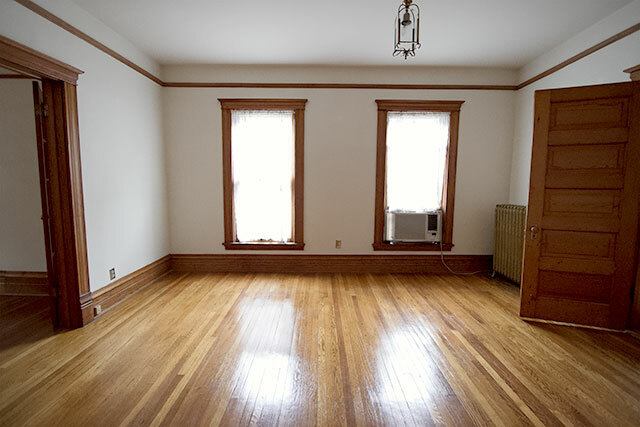 Your new home is stunning…even when it’s empty. The quirks just make it more charming. Wow … so fantastic. With all of the additional space on the second and third floors, I would put your office up there and expand the first floor kitchen to include the adjacent room you are planning to use as your office. That would give you the room to make an efficient and workable floor plan where you could keep the quirky stove, but potentially add something more modern as well. Why not make the small bedroom into a huge closet/dressing room (with laundry?) and turn the second kitchen into a huge master bath. I may be imagining the floor plan wrong for this, however. I thought we were the only ones with a pull chain toilet! Laundry in the attic would be awful in an old house… I can just imagine the loud, rumbling, vibrating for the spin cycle. Seriously, it might be more pretty than the basement and more convenient to be near bedrooms, but even modern washing machines are loud if they’re not on a nice solid, levelled base. And any noise like that from above would sound louder, so I personally would never want it up in the attic. oh wow….that 2nd kitchen says OFFICE to me, except in a house with that many floors I would totally want it to be on a different floor than my bedroom. Lots of room (literally) to grow and switch things around in. I totally hear you about wanting to live in it for a while to see what works though! GORGEOUS home Nicole! I’m from Louisville, KY, where we have the largest collection of Victorian homes in the country and i just LOVE, LOVE, LOVE them! Yours appears to be in pristine condition…what a GEM! I agree with the previous posters…keep the second kitchen intact and make a fabulous studio/craft room. You have delicious taste and I cannot wait to see what you do first! 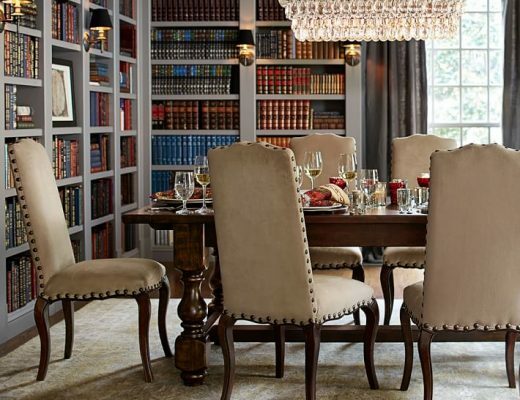 Love the idea of a library–that would be my dream! It’s too bad that you couldn’t have the laundry on the same floor as the bedrooms though. A rolling library ladder! Yes! Leave the sink and convert the room into a super neat parlour with a wet bar! Beautiful glass, some chesterfield lounges – all set for swigging some congac! I see folks saying it in previous comments, but I would totally go for an AMAZING kids (or family) play / art room. I would turn the second kitchen into the ultimate sewing room. The cabinetry would be perfect for sewing supplies and fabric. Then again, I do a lot of sewing ;). I’m on board with the craft/art room idea too! All of those built-in cabinets for supplies and the cute sink! I’m thinking maybe a laundry area off to the side in this room too. Our second floor laundry was extremely convenient. It was my mom’s crafting/laundry/shop inventory space. I feel like the second kitchen upstairs could become a big master bathroom. I mean, it would be over the top (the room seems HUGE) but there’s already plumbing running to that room and there’s probably a plumbing stack you can tap into, and you can keep the magnificent wooden cabinets for storage of towels and sea sponges and WHUTEVAR. More pictures of pin up girls! It could also being an amazing craft room for the kids, because with the sink there (if it’s operational) you have easy clean up after painting projects, paper mache, etcetera. It might make a very fun science lab, too. That could be Brandon’s own blog! Stay at home father teaches children a bazillion simple science projects to his kids, then has tea party with trains and ponies. Yes to the library and making the “second kitchen” an art/craft room. I am having so much fun with your new house already…vicarious living right here! 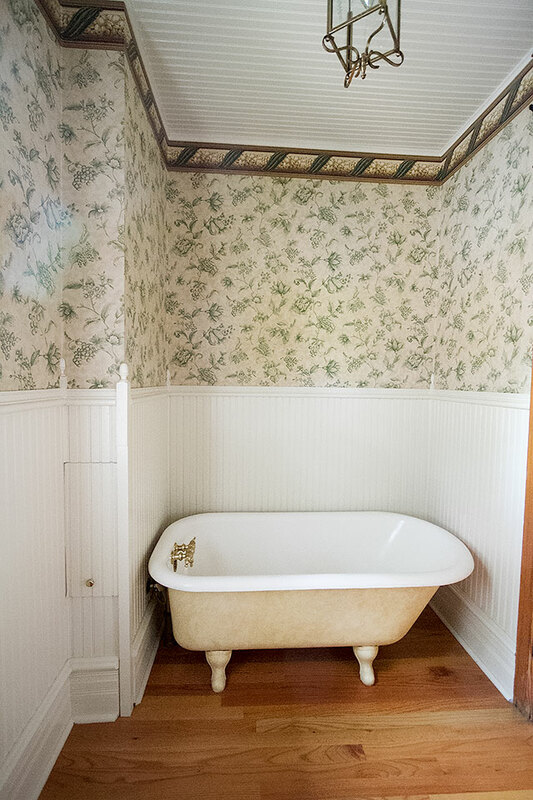 Oh and tile and a gorgeous curtain and that adorable claw foot tub becomes a shower. Clearly, kitchen #2 should be a dressing room with a mini-bar! Your house is a dream. The creative side of me would love to see the second kitchen become a craft room or office! But the Practical Patty in me thinks it would be an awesome laundry room – when I grow up we’ll have our laundry room upstairs. One thing I always remember as a kid was my mom having to drag all the laundry down two flights of stairs to the basement, then back up again. Made zero sense. Make that second kitchen a laundry room/craft sewing room. You’ll have plenty of ironing room too! You won’t regret it! If you have a 3rd child you’ll be thankful for it! After having our 3rd, that’s when I noticed our laundry getting crazier & crazier. The second kitchen need so be a craft/creative room!!! Hello!! Or maybe you have one on another floor…sigh…the room!! Agree! Always great to have a separate place for creativity. Cannot wait to see all your goodies in it! Definitely a craft & project/homework room. The kids will be needing a homework spot before you know it! Love the new house and all of it’s exciting possibilities! I live just west of you (Elmhurst), so will be walking around Oak Park trying to pick out your home!